The 1st SS Panzer Division Leibstandarte SS Adolf Hitler (often abbreviated as LSSAH) began as Adolf Hitler's personal bodyguard, responsible for guarding the Führer's person, offices, and residences. Initially the size of a regiment, the LSSAH eventually grew into a division-sized unit. Members of the LSSAH perpetrated numerous atrocities and war crimes, including the Malmedy massacre. They killed at least an estimated 5,000 prisoners of war in the period 1940–1945, mostly on the Eastern Front. The kit comes in a shrink-wrapped end-opening type box. I am no fan of this type of box, because invariably parts or the decal sheet will find their way past one of the end flaps to become lost. Give me a tray and lid type box any day of the week. The Mariupol mentioned in the kit's title is a city in S.E. Ukraine. 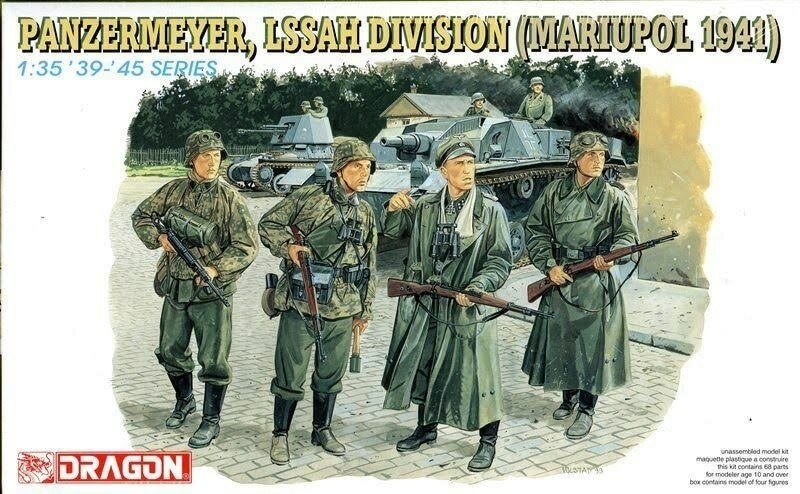 The box art shows 4 liebstandarte SS Adolf Hitler troops standing in a group on a brick street next to a building. In the background is a sturmgeschutz IV and a Pz.Kpfw. II with their troops looking out of the tops. In the distance is a dense woods. All of the infantrymen wear cammo covers on their steel helmets. The officer wears a cloth peaked hat. Two infantrymen wear cammo smocks over field grey trousers tucked into black jack boots. They have full field equipment. One of them carries a MP40 and a gas mask canister slung on his chest. He has goggles strung on his helmet. The second infantryman carries a 98K carbine and a potato masher grenade. The third infantryman and the officer both wear long motorcycle coats and black jack boots. The infantryman has a pair of goggles strung on his helmet and is carrying a 98K carbine. He just has 98K ammo pouches on his belt. The officer is wearing a white scarf around his neck. He also carries a 98K carbine. He has a pair of binoculars hung from his neck. This is followed by "Not suitable for children under 3 due to small parts" in multiple languages including English. 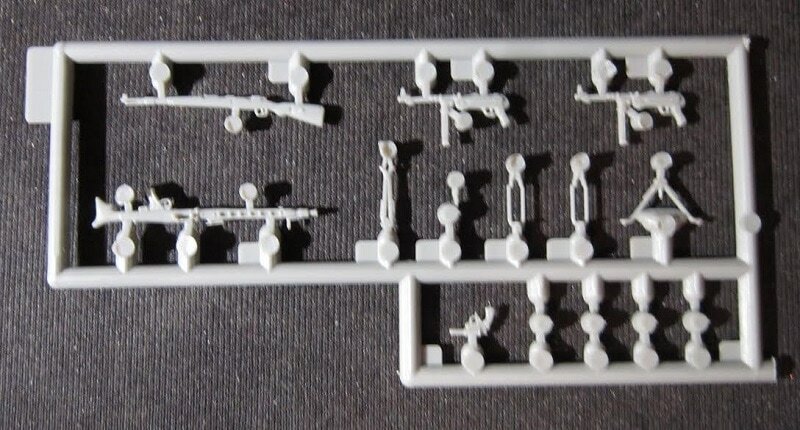 The kit is intended for modelers over 10 years of age. 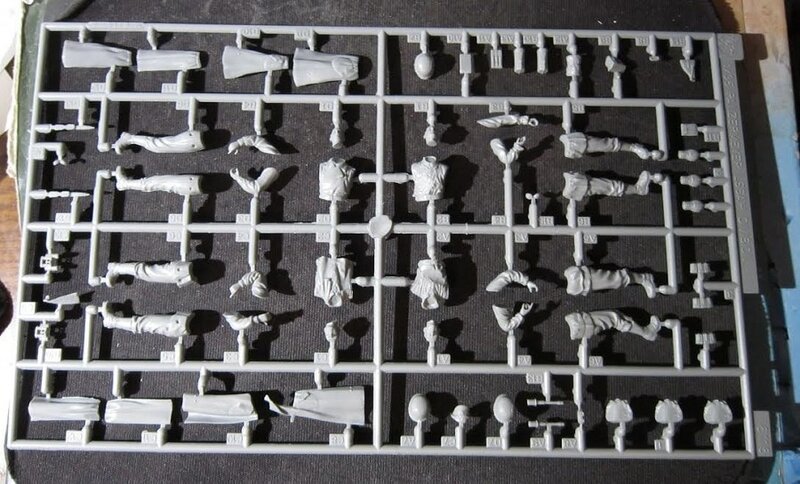 The other side panel says that the kit contains parts for four figures and that paint and glue are not included. This is followed by the 1999 copyright date and DML's street address in Hong Kong, China and MADE IN HONG KONG. The bottom of the box serves as the assembly and painting instructions in full color. ​There are four 2-views of the figures. 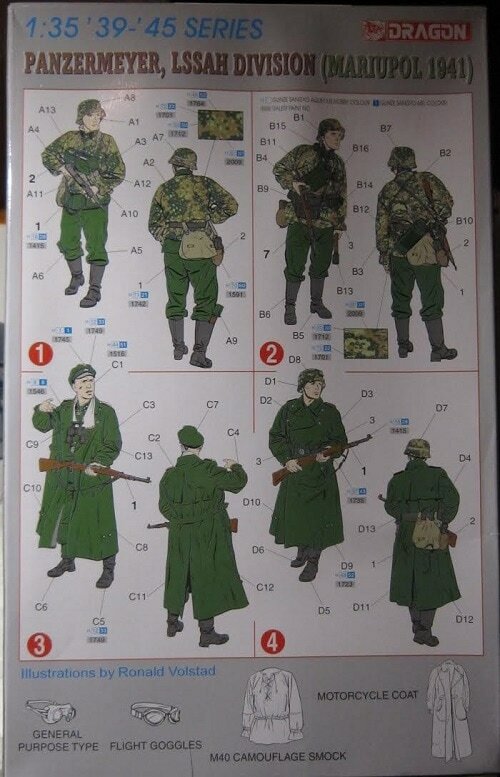 Also included is a color patch of a camouflage pattern. Below these is black and white illustrations of a general purpose type goggles, a flight type goggles, a M40 camouflage smock and a long motorcycle coat. This kit contains 3 light grey trees of parts in a sealed cello bag. ​This is a neat kit. I would have preferred more action poses of the figures, instead of them just standing around. ​I won this kit in a IPMS contest raffle that I just attended.